Summary (from Goodreads): After a summer spent trying to prevent a catastrophic war among the Greek gods, Percy Jackson is finding his seventh-grade school year unnervingly quiet. His biggest problem is dealing with his new friend, Tyson, a six-foot-three, mentally challenged homeless kid who follows Percy everywhere, making it hard for Percy to have any normal friends. But things don't stay quiet for long. My Summary: After spending the year at yet another school, Percy Jackson is excited to go back to Camp Half-Blood. He's proud of myself for having made it through an entire year without any trouble - of the bully or mythological monster variety - but he's sad to be leaving his buddy Tyson - a six foot something sweetheart who gets bullied constantly for being a 'charity case'. Percy is his only friend, which (unfortunately) means Tyson is Percy's only friend. On the last day of seventh grade, the kids are rallied into the gym to play a regulation game of dodge ball. Unfortunately for Percy, his opponents aren't what they seem. Percy is defenseless without his sword, and he's sure it's the end - until an old friend from camp comes to his rescue. Now, Percy, Tyson, and Annabeth have to make it back to camp without getting killed... but what they find their isn't even close to what they expected. My Thoughts: This is the second book in the series, and for some reason, I didn't like it as much as the first one (this happens a lot, though, so I was expecting it). 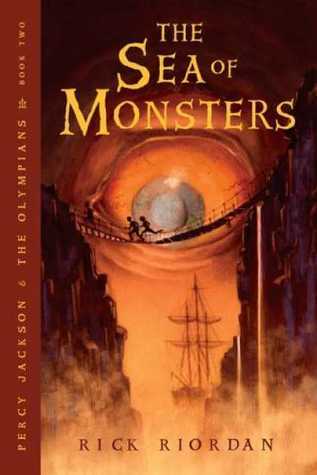 The plot seemed a little bit different than the first book - I think it was because the plot of The Lightning Thief had a few more twists and turns and secrets, while the plot of The Sea of Monsters was a little bit more straight-forward. Anyway, it wasn't a HUGE difference. I still enjoyed this one a lot. There were a lot of things in this one that I really enjoyed. Firstly, Tyson was a great addition to the series! The poor kid is treated so badly by everyone that I just wanted to give him a big hug (and a pony, but you won't understand why until you read the book). Second, I loved the way the characters have matured since the first novel - it's very believable. You see the development of anxiety about the way they look (totally believable) and the strengthening of the relationship between Percy and Annabeth (and you get the sense he already has feelings for her - so cute!). And the ending! Man, I did NOT see that one coming! Final Thoughts: I definitely recommend continuing with the series if you've already read The Lightning Thief, and if you haven't, I recommend you do! It's a great break from the stuff I usually read, and there's enough action and mystery to keep you hooked no matter what your age. I completely agree with you here. I LOVED Tyson but I also liked the first book much more than the second. I can't wait for you to finish this series because it's a good one all around. I have never understood why people pick on one person (as you describe happens to Tyson). Cruelty never benefits anyone. I hope Tyson becomes like Mike Tyson and stops the bullying. haha Tyson is such a great character. Still need to read the first one. But I know what you mean about a second book following a great debut book.